*and by soon, I mean Jan. 8th-ish. Wow, today is the last day! I thought it only appropriate to end this series with a recipe for pickled herring. Seeing as I will be consuming mass amounts of this stuff in the next few days in a variety of flavors (creamed herring, wine herring, mustard herring...), I thought it'd be fun to try and make my own. So I asked Pernilla over from Swedish Corner - Down Under to share her recipe! 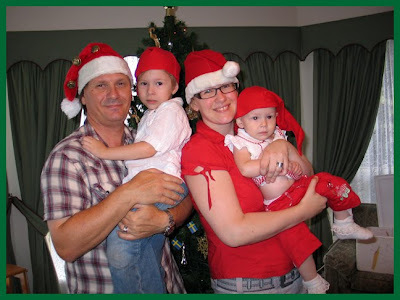 Pernilla is a Swede who is living in Australia. 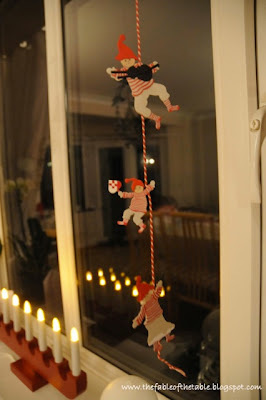 Pernilla's blog showcases all sorts of wonderful Scandinavian crafts and decor. She also shares many of her family's traditions, like Lucia day! I'm so glad she could join in and share her pickled herring recipe, thank you Pernilla! Let mixture come to a boil and make sure the sugar disolve. Leave to cool on the stove. 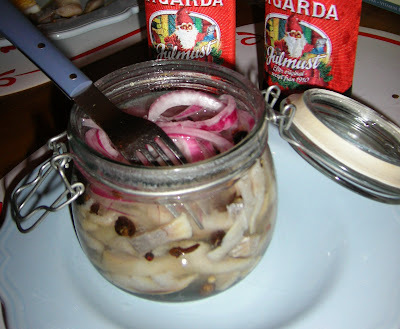 Put in layers of herring and sliced Spanish red onion in a preferred jar. Pour cool mixture into the jar and let it stay in the fridge for at least 1-2 days to set. And a huge thank you to everyone who participated and shared such wonderful recipes and crafts!! God Jul! Day 10, wow! Today the crafty Ingrid is joining us from The Fable of the Table. 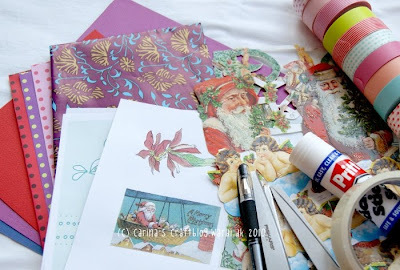 Ingrid's blog is a cute collection of photos, crafts and inspiration - check it out! She even has quite a few posts about Scandinavian things, like Nisse. Today she will share how to make your home cozy and Christmas-y, the Danish way. Like the idea of creating a social nirvana in your home this winter? Then you need a a little Danish hygge in your life. If this is a new word to you, trust me, you will be hearing it everywhere soon. The Danes have a special skill at creating conviviality, contentment and cosiness in their homes. They describe this feeling as hyggelig, pronounced “hew-gir-li”, better if you have had a snaps and pucker your lips up. It is part of the Danish subconscious. Being half-Danish and having lived there for four years, I know how important creating a hyggelig home is to keep you going through the long, cold, dark winter. Home is where the hyggelig happens. You’ll let your neighbours know you are home when you add lights to your window sill. When they know you have a hyggelig home, they’ll be round all the time! 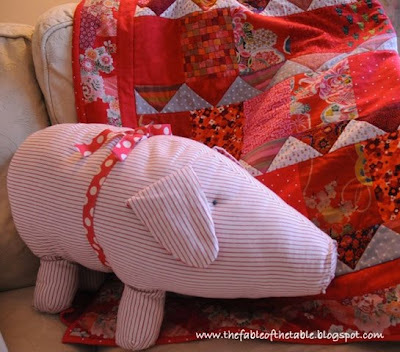 Grab a colourful quilt and throw it over the back of your sofa, ready to curl up under. 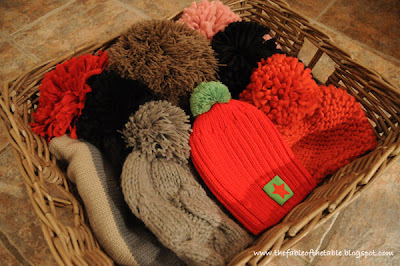 Even if you get no further than the front door, a basket of woolly bobble hats ready to wear out for a winter walk will make you feel cosy just looking at them! Light lots of candles -- just looking at flickering flames brings a warmth to your room. Adding extra candles is like having extra guests, you can never have too many. Invite friends round for Glogg and cookies -- don’t be surprised if the Glogg is more popular. Games to play and jigsaws to puzzle over bring you together. Games from your childhood are not just things to play, they evoke memories of times past and create long-term family traditions. Relaxed hospitality is essential -- it is hard to be hyggelig by yourself. Day 9! Today we will hear from Lina, a Swede living in Borås who makes one mean mug of glögg. She's going to give us a little history lesson about glögg and, don't worry, she'll share her favorite glögg recipe too! Lina and I met 2003 (wow, 7 years ago already?!) when I was studying in Sweden. She later moved to Chicago for a while and we spent many Fridays having coffee and eating lots of Scandinavian-style sweets (chokladbollar, anyone? ), good times. The word glögg comes from the old Swedish word of ‘glödga’ that translates to heat. In the middle of the/late nineteenth century (1890’s) glögg became a Swedish Christmas tradition. Many wine sellers had their own special recipes, which they would bottle and sell with labels, often with a "tomte" motif. Today Swedes drink about 5 million liters of glögg every Christmas! We usually start drinking it on the first of advent, which just so happened to occur on my birthday this year - Nov. 28th! These days you can drink more modern flavors of glögg , like licorice, lingonberry or apple. At the Systembolaget there are new flavors to try every year! Gently heat a bottle of red wine (preferably a Cabernet Sauvignon, Shiraz, or Pinotage) to 55-60 degrees °C on the stovetop. At 78°C the alcohol will start to evaporate so make sure it doesn’t come to a boil unless you want non-alcoholic Glögg. 1 ml spoon of nutmeg. Then add . 5 dl of sugar along with 1-2 dl port or cognac (if you want it strong). When it reaches 55 C it's ready to drink. Serve with raisins and chopped almonds! Today's guest blogger is Rachel from Nest Full of Eggs. Rachel's blog is full of crafty ideas for decorating your house, she has pretty awesome Christmas decor too! She also has quite a few Scandinavian posts about St. Lucia (including an adorable homemade banner) and other Swedish traditions. She enjoys sewing, knitting, photography and paper crafting. She also contributed to the craft book, "Craft Challenge: Dozens of Ways to Repurpose Scarves," which comes out next Spring! Rachel is 50% Swedish and knows how to throw a good Swedish Christmas smorgasbord. Today she will share how to give your Christmas gifts some Scandinavian flare! A very easy way to add a Scandinavian touch to your gift giving this Christmas season is by wrapping your gifts with Nordic crosses also known as Scandinavian crosses. The cross symbolizes Christianity and although all the Scandinavian flags share this, they have their own histories & symbolism. For this project gather your gifts to be wrapped, rectangular gifts & rectangular shaped boxes work best since they are more flag shaped. I had this puzzle of Sweden to wrap & thought what better way to wrap it then as a Swedish flag? Also a quick tip: cereal boxes (which are rectangular shaped) make great shirt boxes. For the crosses you could use: fabric ribbons, gift wrapping ribbons, colored masking tapes, or Japanese colored masking tapes. If using ribbon, you will also need double sided tape (instead of tying the ribbon I taped the ribbon ends down with double sided tape). Denmark: did you know that Denmark was the first flag? It is red with a white Scandinavian cross. Norway: did you know that Norway was the first to use 3 colors? It is red with an indigo blue Scandinavian cross outlined in white. For this gift wrapping you will need a wider white, so you can see the white on both sides of the blue, also, do the white cross first, then the blue cross. Finland: a blue Scandinavian cross on a white background. The blue coloring is said to represent the country's thousands of lakes and the sky, with white for the snow that covers the land in winter. Iceland: blue with a red cross outlined in white. The colors stand for 3 of the elements that make up the island: blue is the color of the Icelandic mountains, white represents the snow and ice covering the island most of the year, and red the volcanoes on the Island. For this gift wrapping you will need a wide white, so you can see the white on both sides of the red, also, do the white cross first, then the red cross. Enjoy ! Have a Merry Scandinavian Christmas ! Thank you Rachel! Be sure to pop over to Nest Full of Eggs and say hello! 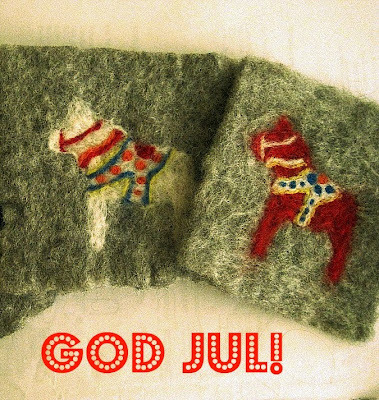 Welcome everyone, so glad you made it over to Scandinavian Christmas for Day 7! If you're just joining in the fun, be sure to check out the previous 6 days of Scandinavian madness full of tutorials and recipes. And now...Day 7! I'm so happy that today my dear friend, Alisha, is joining us from her blog, Turning Over a New Leaf. Alisha and I were actually roommates once upon a time and if you remember when I posted about friends visiting Japan, she was that friend. Alisha makes really awesome handmade cards with great detail and adds nuances I would never think of. She isn't actually Scandinavian (gasp!) but is familiar with many of the customs from attending North Park University and once living with a Scandinavian roommate. So here she is, take it away Alisha! I am an honorary Scandinavian, although I have been mistaken for a Swede before, so maybe there's something I don't know about my family tree... Either way, I love cards! If you're anything like me, and haven't made your Christmas cards yet this season, here two easy options for some cute cards! I like to start with a neutral piece of 8.5 by 11 cardstock that you can simply cut in half. For the first card, I've chosen to recreate a Scandinavian Christmas Elf. You will need red and off white card stock. Cut one red piece out in a triangle to look like the elf hat. Then cut out 4 circles. Two very small red pieces for the hands, another red circle (the biggest) for the body, and one more (off-white) for the head. 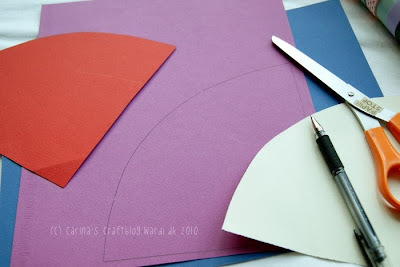 Next glue the pieces on starting with the biggest red circle for the body and place it where you want it on the card. Next the off-white circle for the head, then the triangle for the hat and lastly the two smaller circles for the hands. If you want your elf to have a face, feel free to draw it one with a pen! Lastly add your favorite Christmas greeting, and you've got a fun Christmas Elf card! 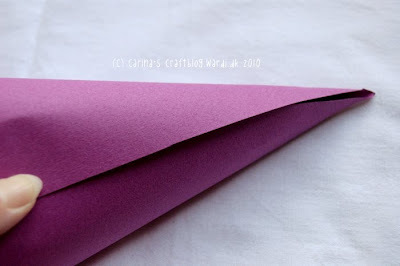 For the next card you will need three different colors of card stock cut into increasingly bigger triangles. I like to use the same family of color. 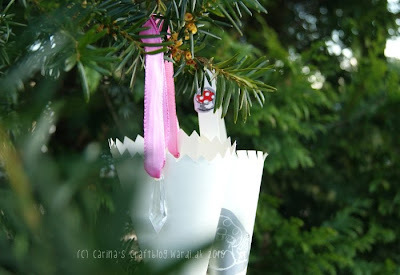 You will also need something for the trunk of the tree, I used ribbon, but cardstock or felt will work great too. Lastly you'll need pop-up foam squares. 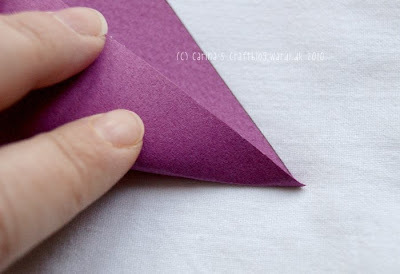 Glue the biggest triangle and the trunk flat to the card. Then add the foam squares to the two other smaller triangles. Now place the other two triangles on top of each other and add them to the card as well. Now add your favorite Christmas greeting and you're finished! Merry Christmas/ God Jul everyone!! Wow, it's already Day 6 of Scandinavian Christmas! 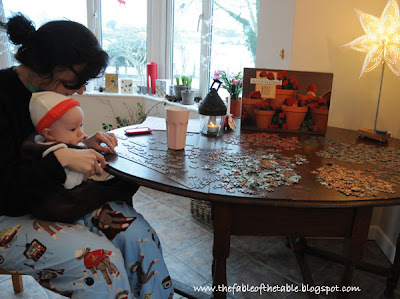 And today Carina is popping over from Carina's Craftblog, a blog that is bursting with cuteness. Carina is incredibly talented and makes amazing embroidery patterns, check out her shop, Polka and Bloom. And if those weren't cute enough, she also has some pretty awesome tutorials, free patterns, fabric designs and embroidery books too! On top of being a super-talented crafter, she's a Scandinavian (Danish) girl who loves celebrating Christmas! It doesn't get much better than that. 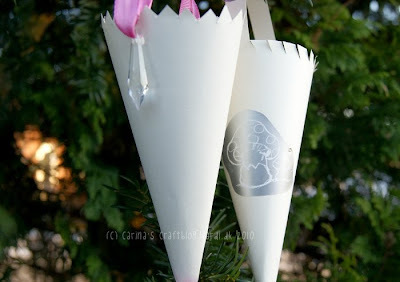 I grew up in Denmark and every year for Christmas we made these cones ('kræmmerhuse') to decorate the Christmas tree. They are traditionally hung on the tree and then filled with cookies or sweets. You will need paper or thin card stock, plain or patterned. Glue, sticky tape, some fancy decorated tape if you've got it. Scissors or knife and cutting mat. Glitter and small Christmassy pictures for decorating. Print off the template, trace onto your paper and cut out cones and handles. 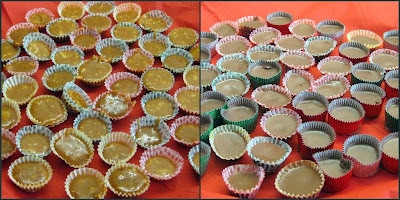 The template has three different cone sizes. Lightly fold one straight edge of the cone towards the other straight edge, this will help make the point.. pointy! Add glue on the other edge and fold it over the first edge. It can be a bit tricky to make everything line up properly and make the point sharp. It may be a good idea to practive the cone 'folding' before you add glue. 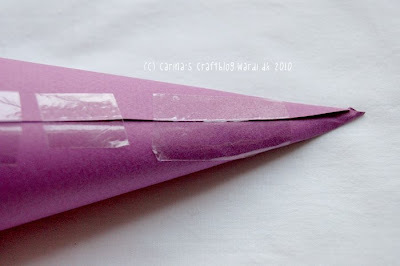 If you are a silly person like moi, you make your cone from card stock that is too thick and then you can forget about glueing in and you will have to stick it down with tape! Add glue to the outside of the ends of the handles and stick in place inside the cone. 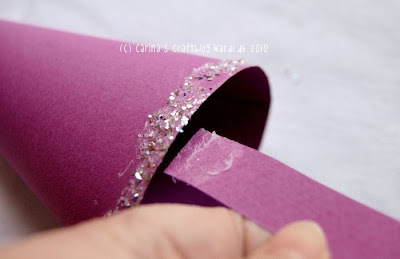 Add glue along the rim of the cone and dip in glitter. 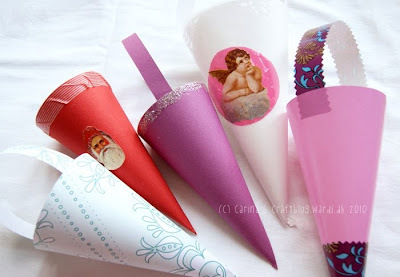 Cut pretty pictures from magazines or wrapping paper and glue onto the cone.